Shiatsu is a traditional Japanese technique, thousands of years old, involving finger pressure applied to the feet and palms of the hands to bring the vital chi energy into harmony. This ancient therapy might help to prevent illnesses and to relieve pains. It can be done as a do-it-yourself technique, or by a professional shiatsu therapist. + In shiatsu, presure is applied on some of the body's 354 acupressure points for short periods, as a treatment working on the meridians of the body to put our chi or life energy into balance. The technique is based on the principle that physical and mental health are related to the energy that flows through channels or “meridians” along the body, connecting the internal organs to our emotions. 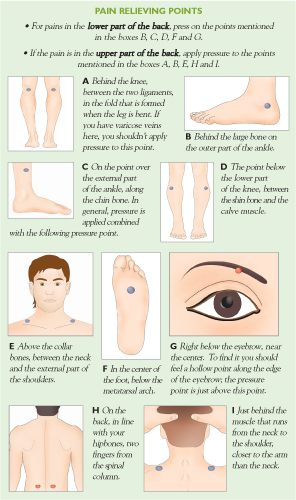 Acupressure points are located along these channels. The pressure applied can give effective relief to backaches caused by tension and muscular cramps. As with any other medicine or remedy, especially if you have chronic or intense pains, you should consult a physician to find out if these alternatives are right for you. There are a number of situations in which patients should not be administered shiatsu: if you have a fever; if the point is below a mole or birthmark, wart, varicose vein, burn, scar, cut or any other type of skin sore. Shiatsu should not be used on pregnant women, especially during the first three months of pregnancy. The following self-massages are recommended for those who suffer from lower back pain and sciatic nerve problems. The sequences should be repeated twice daily until your pain disappears. Sit down on the edge of a seat, so that you can reach your lower back, the points of the waist that run from the buttocks, tailbone, until the highest part of the back that you can reach with your hands. This sequence ends with the pair of points above the waist. Apply firm pressure simultaneously on both sides. 1. Place the index, middle and ring fingers of both hands on your buttocks, where your back ends. Apply firm pressure for three seconds. 2. Place your hands two fingers higher, following the same line and apply firm pressure. 3. Continue climbing up the back, stopping at each point on the back (two fingers higher than the previous point). Firmly press on each point for three seconds. Keep your ring finger, about a finger width away from the spine. The points of the abdomen run vertically in three lines. The first runs down the center; the other two on either side of the center. This exercise can be done lying down or sitting. 1. Place your hands below the edge of your rib cage. Apply moderate pressure for three seconds. Rest. 2. Move your hands in a straight line downward half way between the previous pressure point and the waist. Repeat using moderate pressure. 3. Move down to the point located at the midpoint between the waist and pubis. Press two more times for three seconds each time. 4. Place your palms on your abdomen. Apply gentle, simultaneous pressure. Move your hands so that you cover all the points on the abdomen with light pressure. Concentrate on the muscles that seem to be most tense. This therapy may relieve tensions and blocked energy: it's practiced on the back to relax and reactivate the nervous system. The following pages explain all the secrets to giving a shiatsu massage to a loved one. 1. Sit, crouched over the back of the person receiving the massage. Place the palms of your hands on both sides of the spine. 2. Ask the person to inhale, and while he or she exhales, use your weight to apply pressure with your hands over the back and relax the pressure when they inhale again. Rub your hands downward and apply pressure again. 3. Start on the upper back and work downward until you reach the tailbone. Repeat three times. Kneel down at right angles in relation to the person receiving the massage. Place your hands in the depression (furthest away from you) that the muscles surrounding the spine form. Rock your partner's body with your hands cupped. You can work down the back at the same time, keeping rhythmic movements. Repeat three times on each side of the back, always placing yourself on the opposite side you are working on. This technique centers on the spine itself. Cup the crests of the vertebrae between the thumb and fingers of both hands. Maintaining a firm and continuous contact, move your hands along the whole of the spine, from top to bottom, moving your hands side by side as you go, first one hand, then the other. This loosens the muscles and stimulates the nervous system. Don't limit yourself to only one session; you should complete several sessions, each lasting an hour. You should see positive results after the first session. It's best to practice shiatsu in an ample, well-ventilated and quiet room, with soft music in the background. Massages should be done on the floor or another firm surface. Place your right hand on the lower back of the person who's receiving the massage. Use edge of the palm of your left hand as if it were a knife, making sawing movements on both sides of the spine, moving downward. Apply on one side and then the other side. Repeat three times. Place your thumbs on both sides of the muscles running along the spine and apply pressure, accompanying the breathing of your partner. Start from the top and work down until you reach the tailbone. Place one hand above the other on your partner's lower back. Press, concentrating the energy on the base of the spine. 1. Sit beside your partner. Separate your partner's legs and apply pressure on the buttocks with your forearm, using a penetrating and rocking action. You should work on both muscles, always working from the side closest to your body and then switching sides. 2. Place the left hand on the lumbar spine and the right forearm on the buttocks. Give the massage by rocking the forearm backward and forward. You will have to vary your position to reach the entire leg without having to strain yourself. Place your hand on the back of the thigh. With the other, work down the calf pressing with your palm. Repeat on the other side. This thousand year old technique is very effective to relieve changes in your sleep routine, anxiety, tiredness, depression, stress, over worked nerves and neurosis, all problems that can cause occasional back pains. It also may help to relieve cramps, sports injuries, sprains and it improves your skin tone and brings increased muscular flexibility, mental clarity and concentration. It is beneficial for the joints and helps to correct your posture and improves overall health. 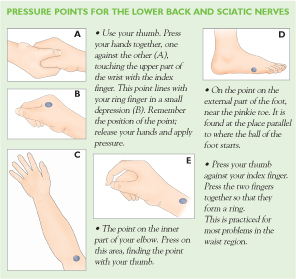 Wrap your hand around your partner's ankle and with your other hand apply thumb pressure on the F point (see page 35), a third of the distance between the base of your second toe and the base of the heel. Repeat on the other foot. 1. Grasp your partner's ankle and bend his leg toward the buttocks. Vary your position to be able to use your weight to bend the leg. 2. Next, position yourself at your partner's feet. Grasp his ankle firmly with both hands and stretch the leg back. Repeat with the other leg. In shiatsu, pressure is applied to the points using the palms of the hands, fingers, elbows, forearms, knees and feet, without any instruments or creams. To move the flow of energy, stretches, rotation of joints, rubbing, lifting, rolling and pounding are used. Cross your partner's ankles and slowly push them toward the buttocks. Do this bend two times, first placing the most flexible leg forward so that it reaches the buttocks and then reversing the legs. Move to the other side of your partner. Without losing contact, change legs and repeat. Stand up and stand on the balls of your partner's feet with your heels. Ask your partner to slightly turn the feet toward each other. Keep your weight on the balls of your feet, not your heels. To complete this exercise, return to the beginning, with the hand on the lower back of your partner. Continue with the contact and then gently interrupt the contact to end the session.